not all that deep down low." Features Coaxial driver is used so speaker operates as a point source -- "as close to a theoretical ideal of radiating sound from a single area"; sealed-box design with first-order crossover. Use Doug found he needed stands that were a bit higher than he might use otherwise because of the tweeter's position in the coaxial driver; lower-than-average sensitivity may tax some amps noticeably; "the only real caveat to consider when setting up these speakers is that the bass frequencies are not as strong as with some slightly larger and/or ported speakers." Value Compares favorably to the Waveform Mach MC, Mirage MRM-1, Revel Performa M20 and Merlin TSM-SE; "if you're seeking all-out minimonitor performance, put the unique MasterSource 20M on your list." NSM Audio -- part of the same company that makes MasterSource Audio speakers -- has sent me a couple of two-way monitors in the past that have impressed me in certain ways. 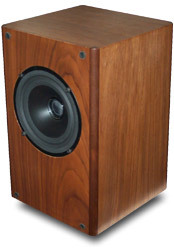 The Model 5 is a surprisingly big-sounding speaker, although it is physically small. The Model 10S, not all that much bigger, has a luxurious and liquid sound that can be quite enticing. These arent speakers for big rooms. Rather, theyre small-room speakers that can provide superb performance in a more intimate way. And set up right, both of these speakers can image like champions -- producing an almost holographic soundstage. So when MasterSource Audio -- the more upscale part of the company -- said they wanted to send me one of their pricier speakers, I was all, uh, ears. The 20M is a very different speaker than most people are used to seeing because it uses a two-way coaxial driver from SEAS that looks like a single driver. It has the tweeter mounted inside the woofer, right where the dustcap would normally be. The coaxial driver has a 6.5" polypropylene woofer with a magnesium basket and a 1" soft-dome tweeter. The idea in creating a driver like this is so that the speaker acts as a point source -- in other words, as close to a theoretical ideal of radiating sound from a single area. One longtime proponent of this technology has been Tannoy -- you see coaxial drivers in many of their home and professional speakers. Other companies, like KEF with their Q Series, have adopted it too. The other aspect that is different from most two-way monitors today is that the 20M is a sealed-box design. This isnt actually anything new, but its increasingly rare compared to ported designs. The crossover is said to be a minimalist first-order electrical design using premium parts. The company uses silver-over-copper wire to the tweeter and multi-strand copper wire to the woofer. There are two sets of binding posts that allow for biwiring; I inserted the metal jumpers and used the speakers single-wired. The cabinet is of an average size -- 14"H x 9"W x 10"D -- but its the quality of the cabinetwork that really caught my eye. 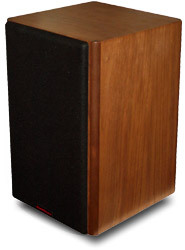 NSM speakers have always been very well finished, but samples Ive seen so far have been in basic black. The 20M arrived with a real-wood veneer, which is typical of speakers in this price range, but this speaker seems one step nicer than most, and it begged for me to take a close look at it. Theres a furniture-like elegance to the 20M thats missing from many speakers, and it has a hand-made quality that implies care and makes me compare it to something like my all-wood Blue Circle Audio BC2 amps that I like so much. The veneer is walnut, and pictures, no matter how good, just dont do it justice. The finish looks slightly dull in photos, but there is a rich vibrancy that breathes higher quality. Fit and finish are excellent -- not a flaw on any side. And the 20M has nice accents. The vertical edges of the cabinet havent just been sanded and smoothed. There are all-wood Peruvian walnut corner moldings that run from top to bottom. The rounded sides of these moldings give the speaker a more refined look and also have the sonic benefit of reduced edge diffraction. The $2295 USD price is hardly low for speakers, and undoubtedly costs could have been cut by putting the speakers in something like a vinyl-covered box. But those who like real wood will want to check the 20M out. A close look beyond the wood reveals that the cabinet isnt quite a rectangular box. Its hard to see in the pictures, and actually almost as hard to see with the speakers right in front of you, but theres a slight angle to the cabinets back wall -- a scant two degrees, says the company. The speakers top is just slightly smaller than its bottom. The slope has likely been done to reduce internal standing waves -- a performance thing. Like smallish two-way speakers that are sealed designs, this one has a lower-than-average quoted efficiency, which MasterSource says is 85dB/1W/1m. The speakers impedance is said to be 8 ohms. The company recommends amplifiers rated from 50W to 150W. The 20M comes with an impressive ten-year warranty -- double the amount most speakers have. Setup and placement in the room were simple. I used both 26"- and 28"-high stands -- fairly high, but remember that the tweeter is in line with the middle of the woofer, so you have to get the speakers higher up than others with the tweeter at the top of the cabinet. Within reason, no matter where I placed the 20Ms in the room I got an even tonal balance and good imaging. This is contrary to some larger speakers with wide-spaced drivers that need space to integrate properly or that interact with wall boundaries differently. The 20Ms, partially due to their small size and most likely due to their moderate bass output and use of a coaxial driver, are very versatile. The only real caveat to consider when setting up these speakers is that the bass frequencies are not as strong as with some slightly larger and/or ported speakers. Closer (but not too close) wall placement proved beneficial in reinforcing the bottom end. And unlike some speakers that compromise soundstaging when placing too close to a boundary, the 20Ms weren't much of a problem in this regard. I used the 20Ms with two sets of electronics. The first system revolved around the 110Wpc Roksan Kandy KA-1 integrated amplifier and matching KC-1 CD player (with the Audio Aero Prima 24/192 CD player used for a time too). The other was my reference system with Theta Digital separates, the Blue Circle Audio BC3000 preamplifier and BC2 monoblock amplifiers. In both cases I used Nordost Red Dawn speaker cables and Nirvana S-L series interconnects. Using the two systems taught me a little about the 20M and amplifier matching. I feared that with the lower-than-average sensitivity, the 75Wpc BC2s might balk at them because of their single-ended operation. Theyre pretty tolerant of a lot of speakers, but they have sputtered with a few, and I feared the 20M would be one of them. It wasnt. For whatever reason the BC2s actually sounded better -- as in more lively and dynamic and clear -- than the more powerful KA-1, which sounded a little bit muted and under stress. And I dont attribute this difference to the fact that the BC2s are a heck of a lot more expensive than the KA-1. The KA-1 usually powers speakers better than the BC2s. It makes me think that this speaker presents a bit of an odd load that some amps may like and others may not. I cued up Sarah McLachlans The Freedom Sessions [Arista 18784], which gave me a strong indication of where we were going with this speaker. "Elsewhere" starts with a tight and deep bass line. The 20M tracks it with control and detail, but from the get-go I could tell that this wasnt a speaker that will impress with its bass extension. Its the type of speaker that lets you know that there is bass down there, but it cant wallop it home. The Revel Performa M20 has similar tightness and control and can extend lower. But this limitation of the 20M is pretty common among smallish speakers, particularly sealed-box jobs. To its credit, it doesnt sound lightweight. When McLachlan started singing and the other instruments came in is when the 20M's strengths started to show. The 20M has a precise character that can show startling resolution. Its presentation is lively in the upper frequencies, smooth and a wee-bit laid-back in the midrange, and tight and controlled in the bass -- but as I said, not all that deep down low. I find this to be is a highly resolving, intimate-sounding speaker that will appeal to people who value high detail and clarity. In fact, it sounds a lot like the no-longer-available Waveform Mach MC (the Mach MC retailed for just over $2000, but the company is out of business). I valued that speaker for many of the same reasons. Voice is portrayed naturally and without excessive warmth. I have heard some speakers produce more texture through the midrange and put the voice more prominently to the front (the Mach MC being one of them), but on things like richly recorded male vocals, the 20M strikes a nice balance between sound thats too much in your face and sound that begs you to turn the volume up a little more. On female vocals, the lively top end can exacerbate sibilance and make etched high frequencies more prominent, but that can be easily offset by playing with toe-in, as I did. The more head-on you listen (i.e., the speaker driver pointing right at you) the more of the highs youre going to hear. I ended up using the speakers almost facing straight ahead in the room with just a few degrees of toe-in -- that puts me off-axis about 25 to 30 degrees. This position seemed to result in the best balance of high-frequency extension and overall pleasantness. The result was an extremely detailed performance and true look-into-the-recording sound. Playing to excessively loud levels isnt the 20M's thing. This is just like the Mach MC, Merlin TSM-SE, and Mirage MRM-1 -- all speakers Ive reviewed over the years that compete with this one. Do it and youll likely hear the 20M congest, or worse yet, make some nasty sounds. Drivers only move so much air, and small drivers move less of it than big ones. The 20M also isnt a speaker thats well suited to party-type rock or dance music. I played the Destinys Child Survivor CD [Columbia 61063] and heard Beyonces voice sound just wonderful through these speakers. But realistically, most who are used to music like this through PA systems will be disappointed compared to the output levels you hear in a nightclub. But thats not what this speaker is about. It's designed to sound intimate and refined and show outstanding resolution all at reasonable volume levels in a smallish to mid-sized room. Thats what a minimonitor can accomplish, and in that vein the 20M does some remarkable things. Set up with care and played within their limits, the 20M rewards with a natural yet highly detailed presentation that doesnt get fatiguing. These speakers are able to show air around instruments and back-of-the-hall sounds that audiophiles value so much. They also excel at what I call "separating the parts." For example, when an instrument is played (or a vocal is sung) in a very large room, there is the main sound and then the discrete echoes in the room (providing the recording captures it all). With low-resolution systems, the separation of the voice and the room gets lost, and the entirety of the music comes through as heavy mush. The 20M cuts like a razor, and this is easy to discern. On things like "This House is on Fire" from Natalie Merchants Motherland [Electra/Asylum 62721], where the drummer is distinctly behind Merchants center-stage voice, the speakers create a virtual separation in the stage that allows me to hear both performers in their own space. Some people may not want to hear all that makes up the music, but others do. Imaging is stellar. I found that both the NSM Model 10S and Model 5 have remarkable ability to cast a stable soundstage with excellent width and depth. This speaker does this too, but it also manages to focus its images even more finely, making its imaging performance among the best Ive heard. I turn to Ani DiFrancos Up Up Up Up Up Up [Righteous Babe Records RBR013-D] often for these tests. "Jukebox" took me a little by surprise. It opens with an acoustic guitar placed right of the stage and back from the speaker plane. With the lively top end of these speakers, the guitar jumped to life with startling focus. I sat mesmerized at the precision with which the instrument was rendered. On "Everest" -- a track I use over and over again -- DiFranco's voice hovers far to the left and just back of the speaker plane. The 20M not only gets it right, it casts her voice in a laser-like way. The best speakers Ive heard in my room in terms of imaging have been the Waveform Mach MC and the ultra-expensive JMlab Mini Utopia. In this regard, the 20M at least equals these fine speakers. Ive already mentioned speakers that the MasterSource 20M competes with in the marketplace, and a comparison to these speakers is obviously warranted. The Waveform Mach MC, Mirage MRM-1, Revel Performa M20 and Merlin TSM-SE (I own the TSM-SE, and its worth noting that this speaker has been updated and is now in its TSM-M incarnation, which I dont have) all retail for around the same price, give or take a few hundred dollars. When it comes to fit and finish, theyre all somewhat different, but none of them can be knocked for quality of workmanship. The build quality for all is top-notch, and its the sound each makes that is the difference. In terms of overall balance, the 20M is most like the Mach MC -- even-sounding with a character that some will describe as lean and with an ability to thoroughly unravel a recording. The main difference comes in the midrange, where the Mach MC is just a bit more up front, more or less projecting vocal images at the speaker plane, and the 20M a tad laid-back, making for a slightly more distant perspective. I would guess that of the two, the Mach MC is the more neutral. The Merlin TSM-SE is similar too, but it has just a wee-bit more treble energy than the 20M and doesnt have the slight distance in the midrange. Bass through all of these is comparable. The Mirage MRM-1 and Revel Performa M20 are the most different of the bunch. Both have deeper bass with a more fleshed-out and full sound. The M20 has the most punchy sound, and the MRM-1 is the fullest-sounding. The M20, like the 20M, has a lively top end, but both can be tamed significantly with toe-in (the M20 also has a treble adjustment). Its the MRM-1, though, that has an even more relaxed midrange than the 20M. Coupled with the full bass, the MRM-1 is the most room-filling with a balance that some will describe as warm and relaxed.
" clause. The not-so-subtle difference between the Roksan and Blue Circle amps I have on hand let me know that amplifier matching is important for these speakers. The BC2s worked exceedingly well, but Im not gullible enough to think that I found the Holy Grail with the only other amp that happened to be in my room. So I cant help but think that there may be a better (and no doubt worse) match out there, and I hope that circumstances will combine and help me find these in the next few months. If it happens, it will be addressed either as a follow-up review or in our "Standout Systems" column that focuses on system synergy. The MasterSource 20M stands tall among its peers and, like all of the speakers mentioned, has some strengths that cause it to poke above in certain areas. But its important to note that no speaker is perfect. As a result, the person who chooses this speaker over some other high-quality monitors wont be doing so because one is necessarily better than the others. The person who chooses one of these speakers over the others will do so because of personal taste and where he or she places priorities in terms of a speakers sonic performance (and perhaps because of styling too). So if you're seeking all-out minimonitor performance, put the unique MasterSource 20M on your list. Price: $2295 USD per pair.